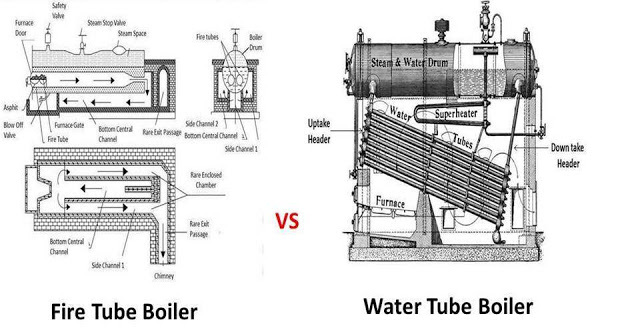 Today I am going to tell you difference between fire tube boiler and water tube boiler. The boiler is divided into two main types. One is known as fire tube boiler and the other one is known as water tube boiler. These boilers is largely used in power development and other industrial like sugar industries, cotton industries etc. for steam generation. The main difference between fire tube and water tube is that in fire tube boiler the flue gases flow in the tubes and water flows from the shell and in water tube boiler, water flows from the tubes and the flue gases from the shell or passes over the tubes. This is the key difference between these boilers. Now I am going to tell you some hidden difference between these boilers. Hot flue gases flow inside the tube and the water outside the tube. Water flows inside the tube and the flue gases outside the tube. This boiler pressure is limited up to 20 bar. These boilers are generally low or medium pressure boiler. Fire tube boiler have lower rate of steam production compare to water tube. It has higher rate of steam production. These boilers are almost internally fired. Furnace is placed at the one end of fire tube. These boilers are generally externally fired. It is suitable for the production work like sugar mill, textile industries. It is suitable for large power plant. Risk of explosion is lower due to low pressure. Risk of explosion is higher due to high pressure boiler. This boiler occupies large floor space. It occupies less floor space compare to fire tube boiler. It required less skill to operate. It required a skilled operator. It is difficult to repair and cleaning. It is easily clean and repairable due to externally fired. It required large shell diameter because the fire tube situated inside the shell. It required small shell diameter. 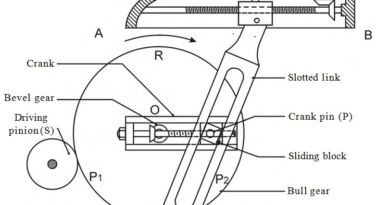 This boiler is difficult to construct. The efficiency of fire tube boiler is less compare to water tube. It will increase by using other accessories. This boiler is more efficient. The maintenance of this boiler is costly. It is required regular inspection. This boiler is easy to maintain. The treatment of water is not necessary. The water flows through small diameter tube. So water is treated before entering into the tube otherwise it will jam the tube. Today we have discussed about difference between fire tube boiler and water tube boiler. If you have any doubt or query regarding this article, ask by commenting. If you like this article, don’t forget to share it on social networks. Subscribe our website for more informative articles. Thanks for reading it.